Mr. Market always wants it all. So it’s no surprise stocks finished Wednesday with a downward bias following Federal Reserve Chairman Jerome Powell’s well-polished presentation to headline-seeking journalists Wednesday afternoon. The Dow Jones Industrial Average fell 141 points, near the lows of the session, breaking a string of very bullish sessions. Big bank stocks such as JPMorgan Chase and Bank of America — which had been rallying nicely into Fed Day — were clobbered. The 10-year Treasury yield dove to its lowest level since January 2018 as the market baked in a prolonged period of meh U.S. growth. Finding what upset the bullish mood of the market isn’t too hard. It actually smacks you right in the face. The question now is whether the Fed in one fell swoop has disrupted the easy money making environment that has gripped Wall Street for most of 2019. The setup into Fed Day was this: A patient Fed on the interest rate hiking front would lead to a growth acceleration in the second half of this year. After all, how could the U.S. economy not catch fire with rate hikes all but off the table in 2019, the job market still solid and corporations benefiting from the Trump tax cuts. 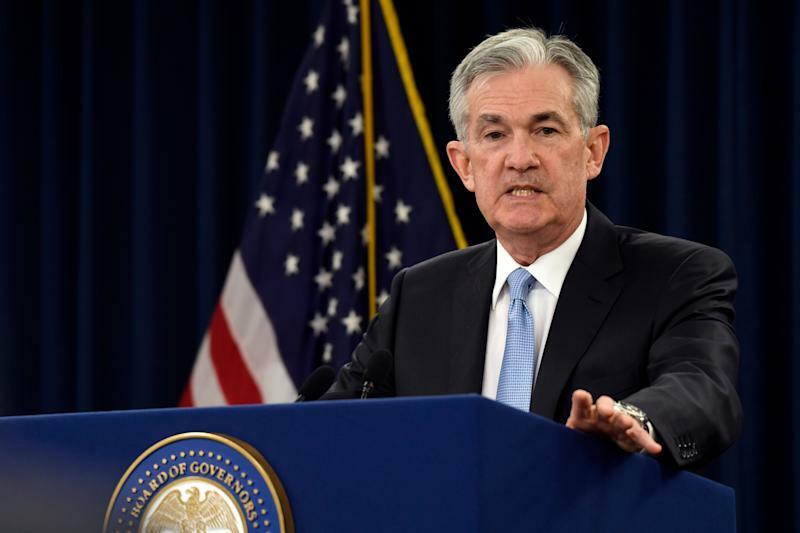 Unfortunately for the bulls, Powell stuck a dagger in their hearts by perhaps being too dovish. Not only did the Fed maintain its interest rate patience and more cautious approach to unwinding its enormous balance sheet, but it slashed its U.S. growth forecasts for 2019 and 2020. It also lifted its projections for the unemployment rate for 2019, 2020 and 2021. The dots on further rate hikes for this year were removed. That all strikes at the heart of the narrative that has sent stocks booming so far this year. In effect, it shows a Fed concerned about the growth outlook for any number of reasons — trade tensions, peak profit margins, higher oil prices, presidential election season dynamics, etc. Keep in mind that apparent concern is despite interest rates at low levels and hikes being swabbed from the table for the foreseeable future. Now some on Wall Street are speculating the growth outlook is such that the Powell Fed will have to cut interest rates later this year . Wait, what? “The Fed’s revised economic projections, which now imply no rate hikes this year, may have been a bit more dovish than most anticipated, but we think their underlying economic forecasts are still too upbeat. We expect economic growth to remain well below trend throughout 2019 which is why we think the Fed’s next move will be to cut interest rates,” says Capital Economics senior U.S. economist Michael Pearce. “The decision to leave the target for the fed funds rate unchanged at 2.25-2.50% was unanimously expected, but the sharp drop in Treasury yields following the decision suggests investors were surprised by the dovish tone of the accompanying statement and economic projections,” adds Pearce. “The Fed does not want to get into the business of predicting the outcome of political decisions, at least publicly, but the removal of both 2019 dots suggests to us that they are much more worried about external risks than we believe is justifiable as a base case,” Pantheon Macroeconomics Chief Economist Ian Shepherdson explains. Has Powell’s more dovish tone spooked investors? Some say yes, others aren’t sold. At least initially, Mr. Market is sold — and he is more worried today on the rally than on Monday.